If you play sports at school or know someone who does, chances are you’re familiar with injuries. Broken bones and concussions do happen, but there are sports out there that can be downright deadly. You’ve probably heard about deaths from IndyCar racing or boxing, but there probably are several deadly sports you’ve never even heard about. BASE jumping is one of those wild and crazy ones where you can lose your life if you aren’t super careful because “an estimated one out of every sixty people who jumps dies.” So just what is BASE jumping? The acronym stands for “buildings, antennae, spans , and earth.” BASE jumpers jump from these rock formations, towers, bridges, and other tall formations and just hope their parachutes open! By the way, BASE jumping is illegal in most states, but you’ll read about one competition that isn’t. One other dangerous sport you may not have heard much about, if anything, is cave diving. A lot of people enjoy exploring caves, but what if they are underwater? Devil’s Eye Cave in Florida is one place a lot of divers head to. Imagine you are “hundreds of feet from the surface entrance” and “the light attached to the back of your hand goes out.” What next? You’ll read about some of the safety precautions divers take, but also about those fatalities. 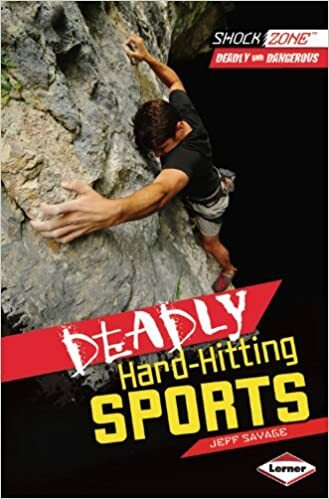 In this book you’ll also read about “deadly hard-hitting sports” such as street luging, boxing, freestyle motocross, free solo climbing, heli-skiing, big-wave surfing, and IndyCar racing. This is an exciting book about dangerous sports that can turn deadly. Kids who like reading about extreme sports will definitely love reading this book. The layout is very appealing with full-color photographs, many that show just how deadly they can be, especially when you see someone jumping from a high tower. There are those statistics that let young people know that these sports are extreme. For example, “an average of 113 people die each year from rock climbing.” Interspersed throughout the book are numerous informative sidebars. For example, one tells about the International Isle of Man Tourist Trophy Race, the “deadliest motorcycle race in the world.” In the back of the book is an index and additional book and website resources to explore. There are additional complementary education resources on the publisher’s website. Quill says: If you have a youngster who is interested in X-treme sports, this is one book you should take a look at!